You’d be forgiven for assuming that selecting a quality screwdriver would be easy. In reality, it’s actually quite the opposite. With literally thousands of options to choose from in all manner of shapes and sizes, finding the very best tool for the job can be challenging. Which is why we’ve pulled together a list of some of the very best screwdrivers on the market right now, in order to make things that little bit easier for you. In theory, all you really need from a screwdriver is for it to cover a few basic yet essential requirements. It needs to be comfortable to hold, provide plenty of grips, withstand relatively harsh punishment and last for as long as possible. Suffice to say, far too much to ask of any substandard tool. Outlined below, you’ll find a range of high-quality screwdrivers and screwdriver sets from the most reputable manufacturers in the business – all tried, tested and trusted for reliable quality and performance. In theory, all you really need from a screwdriver is for it to cover a few basic yet essential requirements. It needs to be comfortable to hold, provide plenty of grip, withstand relatively harsh punishment and last for as long as possible. Suffice to say, far too much to ask of any substandard tool. Outlined below, you’ll find a range of high-quality screwdrivers and screwdriver sets from the most reputable manufacturers in the business – all tried, tested and trusted for reliable quality and performance. ​Sometimes, it’s the simplest tools that come in handiest. In the case of the Stanley 68-012M All-In-One 6-Way Screwdriver, this really is just about as simple and as handy as it gets! If you’re out to pick up a compact all-in-one kit that doesn’t compromise on quality, this is it. Measuring in at 7.75"(196.9mm) long, the Stanley 68-012M Screwdriver has been designed to serve as the only tools you’ll need for any number of everyday jobs. Designed and manufactured by one of the biggest and best names in the business, the kit comes complete with six tips - #1 and #2 Phillips 1/4" and 3/16" Slotted, 1/4" and 5/16" Nut Driver. The space-saving design makes the Stanley 68-012M perfect for keeping around the home, the car or in any professional toolbox. The quality of the materials used in the manufacture of both the handle and the tips is outstanding – long-last durability and value for money. As you’d expect from these guys, the handle is also super-comfortable to hold for long periods and provides plenty of grip in all conditions. Unlike similar kits, you really get the feeling this screwdriver is built to last. Still, when you consider that the folks at Stanley have been doing what they do for more than 170 years, it’s a bit of a no-brainer. And not only is the Stanley 68-012M All-In-One Screwdriver an outstanding tool for all occasions, the current purchase price is no less than a steal. It is an absolute bargain that gets our total recommendation for absolutely any everyday purpose. ​Sticking with the same brand, the Stanley 60-060 Standard Fluted Screwdriver Set is one of the most popular and highest-rated kits in its class. Featuring six hugely versatile drivers for all purposes, the Stanley 60-060 is perfect for domestic and professional use alike. As standard across many of the most popular ranges from Stanley, each driver features an ergonomic, tri-lobular, slip-resistant handle to prevent blisters, while at the same time maximizing torque and providing a secure grip in all conditions. The tips have been designed to perform in even the most challenging environments, unsticking even the most aggressively-worn screws with ease. Covering most everyday needs, the kit comes complete with a 4-inch standard screwdriver, 6-inch standard screwdriver, 3-inch cabinet screwdriver, 6-inch cabinet screwdriver, 1-point Phillips screwdriver, and 2-point Phillips screwdriver. This screwdriver comes with quality materials and a beautifully balanced design combine to deliver a comfortable and capable all-round experience. 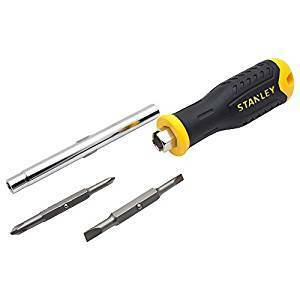 The Stanley 60-060 Screwdriver comes highly-recommended to anyone looking take home an affordable screwdriver kit that’s nonetheless right up there in terms of quality. 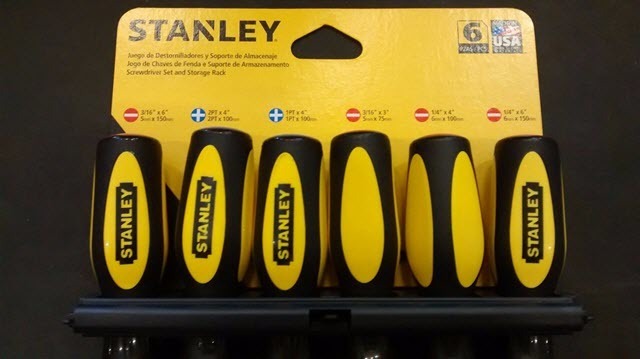 And as you’d expect from these guys, the Stanley 60-060 Screwdriver Set also comes with a full lifetime warranty from the manufacturer. Total peace of mind and unbeatable value for money from the best in the business! ​Coming in at number-three, the Stanley 60-100 10-Piece Standard Fluted Screwdriver Set represents superb value for money. Each screwdriver within the set features an economic and slip-safe handle for the most comfortable grip possible, along with amalgam steel edges with rust verification nickel-plated bar to stand up to pretty much anything you can throw at it. Even more impressive, the manufacturer is so confident in the quality of the screwdrivers that the set is covered by limited time warranty. 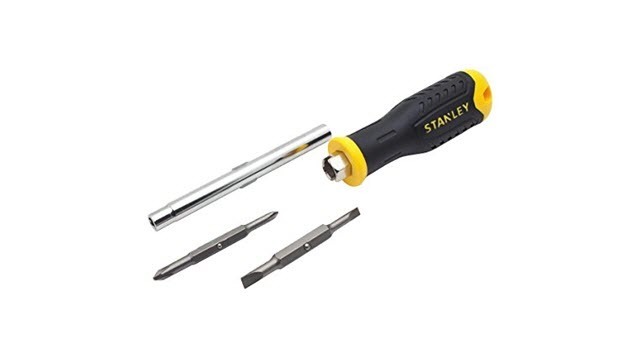 The Stanley Standard Fluted Screwdriver Set features ten of the most common Phillips, opened, squat and pocket screwdrivers, with a clear focus on comfort, performance and getting the job done with ease. ​Take any of the screwdrivers from the set in your own hand, and you immediately know you are holding a tool of high quality. As would be expected from Stanley, the handles are fantastically comfortable and convenient to hold, with non-slip ergonomic grips keeping things safe during use. Even with prolonged use, these Stanley screwdrivers do not become comfortable to hold. The metallic elements of the screwdrivers are produced using the highest quality steel and finished using the strongest chrome. Rather than simply being thrown together, it’s clear that plenty of time and attention to detail have gone into the production of the Stanley 60-100 10-Piece Standard Fluted Screwdriver Set. The kind of set that is guaranteed to go the distance. The whole idea with the ​Stanley 60-100 10-Piece Standard Fluted Screwdriver Set​ is that you pick up this one specific set and never have to repurchase another screwdriver. 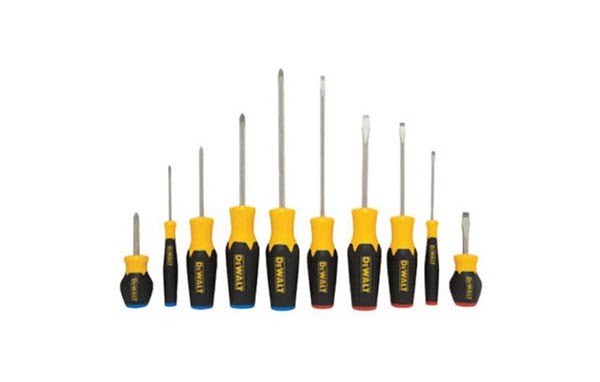 The set features one high-quality screwdriver to suit almost any everyday application, with both flats and Philips head drivers in a variety of sizes. Last but not least, the Stanley 60-100 10-Piece Standard Fluted Screwdriver Set also comes with a handy storage case to help look after your tools while not in use. Simple, effective and extremely sturdy, the case has been designed to provide a higher level of protection for your tools and maximum convenience. Take any of the screwdrivers from the set in your own hand, and you immediately know you are holding a tool of high quality. 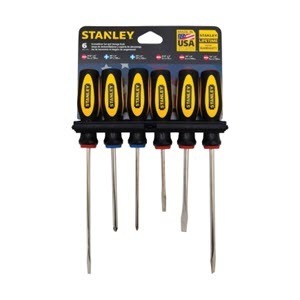 The whole idea with the Stanley 60-100 10-Piece Standard Fluted Screwdriver Set is that you pick up this one specific set and never have to repurchase another screwdriver. 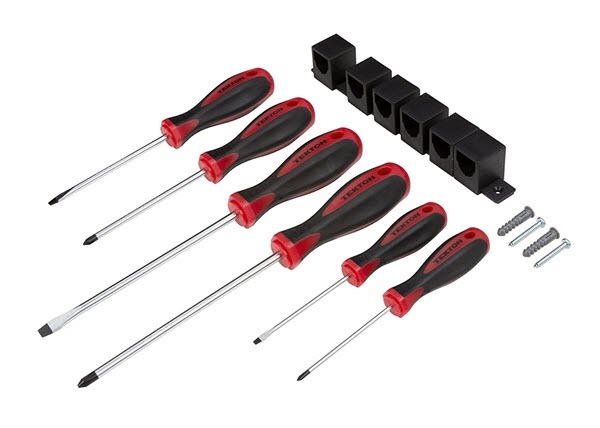 ​For those looking to invest in a slightly larger set for even greater flexibility, the ​Craftsman 9-31794 Slotted Phillips Screwdriver 17 Piece set​ ticks all the right boxes. As the name suggests, this particular site features a full 17 screwdrivers in a range of different shapes, sizes, and specifications. The perfect addition to any existing toolkit, it’s unlikely you will ever find an application for which these guys aren’t perfectly suited. 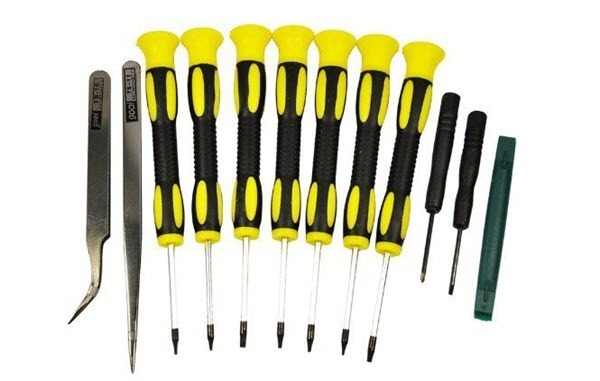 If you’re familiar with the brand, you’ll know the kind of quality to expect with the Craftsman 9-31794 Slotted Phillips Screwdriver 17 Piece set. If not, let’s just say this all-American tool brand is famed for delivering the total package of superb quality and unrivaled value for money. ​The Craftsman 17-Piece Screwdriver Set includes 9 flat and 7 Phillips screwdrivers – each of which has been manufactured to the highest possible quality standards. Superior stainless steel combines with durable plastics for a feeling of incredible strength and durability. Even when used in the most heavy-duty applications, the Craftsman 9-31794 Slotted Phillips Screwdriver 17 Piece set won’t let you down. The strong, butyrate handles are intended for extreme use. Manufactured by one of the most reputable names in the United States, comfort, and a secure grip have clearly been prioritized in the production of the screwdrivers. In all weather conditions and for even the most demanding jobs, the grip remains secure, comfortable and controlled at all times. The plastics are also durable enough to ensure that the handles will not chip, crack or shatter when exposed to relatively heavy impact or drops. What’s great about the​ Craftsman 9-31794 Slotted Phillips Screwdriver 17 Piece set​ is that even after prolonged and comparatively heavy use, these tools still look, feel and perform as if they were a brand new. Given the comparatively low price of the set, this is one package that represents truly outstanding value for money. 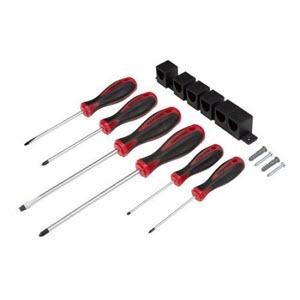 Whether looking to expand your home toolbox or invest in quality tools for commercial/industry purposes, the Craftsman 9-31794 Slotted Phillips Screwdriver 17 Piece set proves you don’t have to spend a fortune to take home something outstanding. The handles sometimes become a little slippery when wet, but then again, you can’t expect miracles for such a low price! 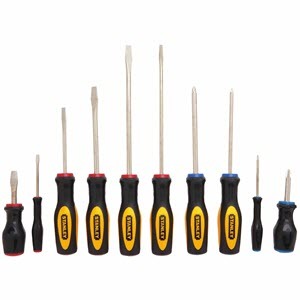 The Craftsman 17-Piece Screwdriver Set includes 9 flat and 7 Phillips screwdrivers – each of which has been manufactured to the highest possible quality standards. 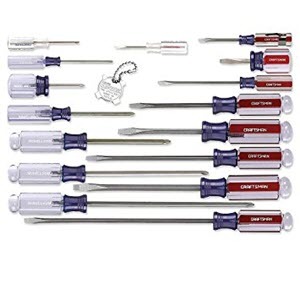 What’s great about the Craftsman 9-31794 Slotted Phillips Screwdriver 17 Piece set is that even after prolonged and comparatively heavy use, these tools still look, feel and perform as if they were a brand new. ​Like the company behind it, this ​DEWALT 10-Piece Screwdriver Set​ means business, i.e., pure and simple. Nothing fancy, no unnecessary garnish and nothing you don’t need. Simply an outstanding set of screwdrivers in a variety of sizes, with exactly the kind of quality you’d expect. Not to mention, unbelievable value for money. ​As with a fair few other sets from the same company, this DEWALT 10-Piece Screwdriver Set features soft handles for extra grip and plenty of comforts. They’re also great for use when things get a little on the wet and slippery side. Maintaining a firm grip in all conditions is a piece of cake with the DEWALT 10-Piece Screwdriver Set. The color-coded ends are a nice touch, making it easy to find the screwdriver type you’re looking for at a glance. In terms of sizes, things start out at 1/8 inch and up to a maximum 1/4 inch – ideal for most DIY and larger projects alike. Tip styles and lengths look a little like this: standard 1/8 in. x 3 in., 1/4 in. x 1-3/4 in., 1/4 in. x 4 in., 3/16 in. x 4 in. ; cabinet 3/16 in. x 6 in. ; Phillips 0 pt x 2-1/4 in., 2 pt x 1-3/4 in., 1 pt x 3 in., 2 pt x 4 in., 2 pt x 6 in. Each of the tools in the ​DEWALT 10-Piece Screwdriver Set​ features a precision sand-blasted tip, ensuring a snug and secure fit with minimal slip-outs. They’re not the most lightweight of screwdrivers, but this is all down to the quality of the materials used to manufacture them. The balance is great, the grip is comfortable, and they get the job done exactly as they were designed to. Once again, it’s a kit that’s no fancy or feature-packed but instead gets down to business. 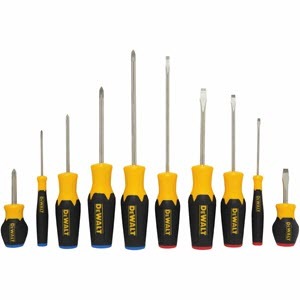 Plus the addition of the usual extensive manufacturer’s warranty makes this DEWALT 10-Piece Screwdriver Set one serious bargain at this kind of price! As with a fair few other sets from the same company, this DEWALT 10-Piece Screwdriver Set features soft handles for extra grip and plenty of comforts. Each of the tools in the DEWALT 10-Piece Screwdriver Set features a precision sand-blasted tip, ensuring a snug and secure fit with minimal slip-outs. ​If you’re looking to get your hands on a screwdriver set that looks as good as it performs, the ​TEKTON 2742 Phillips and Flat Screwdriver Set​ could be it! Along with superb build quality and design, the kit also features a convenient storage rack for wall-mounting. Brilliant for personal and professional use alike at an unbeatable price. This TEKTON 2742 Phillips and Flat Screwdriver Set really isn’t messing about when it comes to build-quality and strength. The shafts have been manufactured with high-strength heat treated chrome vanadium steel and feature a corrosion-resistant chrome plated finish. Which basically translates to incredible durability and total protection from rust and wear. Wherever and however you use these screwdrivers, they’re just about as tough and reliable as it gets. Likewise, the tips have been precision-milled to ensure the best possible fit, while quality magnetized metallic components make for easier one-handed use. No more dropped or lost screws – this is the kind of magnetization that actually works. What’s more, the TEKTON 2742 Phillips and Flat Screwdriver Set boast HexTorque Handle technology, which roughly translates as the securest and most comfortable grip you could ever hope for. Soft, non-slip grips mean maximum turning the power in all conditions, along with day-long comfort – regardless of how intensive the job. Last but not least, the inclusion of a simple rack to mount the screwdrivers on the wall makes a really nice added touch. A small extra that adds up to a big difference – especially if your toolbox is already short on space. 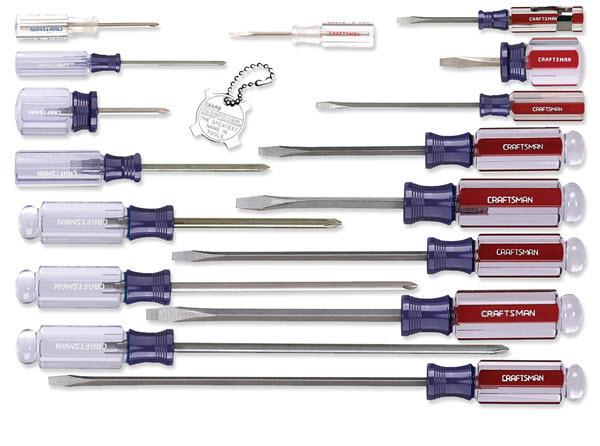 On the whole, a great screwdriver set for an affordable price, all backed by the quality and satisfaction guarantees that come as standard from TEKTON. Soft, non-slip grips mean maximum turning power in all conditions, along with day-long comfort – regardless of how intensive the job. ​If you’re out to pick up the most compact, convenient and cost-effective screwdriver kit on the market, you won’t find much better than this. 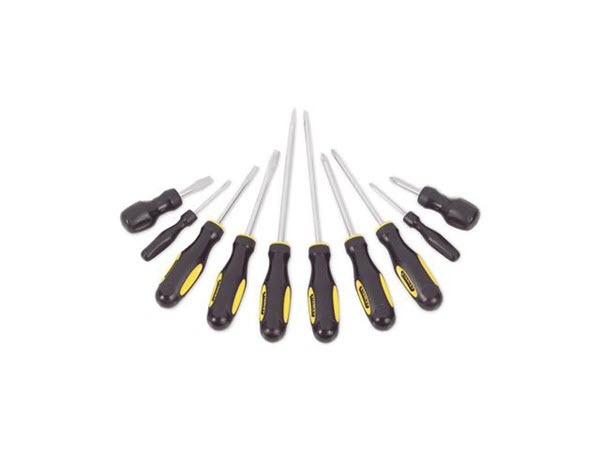 The ​Klein Tools 70035 Magnetic 4-Piece Screwdriver Set​ takes the simplified concept you’re probably already familiar with and injects it with rare quality and performance. Which just goes to show that sometimes, the best things really do come in the smallest packages! ​As you can see from the image, the Klein Tools 4-Piece Magnetic Screwdriver Set comes complete with one primary magnetic screwdriver and four interchangeable bits. The idea is that when not in use, the bits can be stored in the handle of the screwdriver itself. As such, it needs minimal space in your toolbox and couldn’t be more convenient when tackling multiple screw fittings at the same time. While these kinds of kits and designs may be quite common, the quality of the Klein Tools 4-Piece Magnetic Screwdriver Set takes it to a much higher level. First of all, the built-in magnet that holds the tips in place is powerful to ensure zero slip-outs or accidents while in-use. Built to go the distance, the shaft is made with tempered, heat-treated steel for lasting durability and rust-resistance. The precision-machined tips are likewise manufactured to the highest quality standard, offering a secure and safe fit with powerful magnetic properties. Regarding tip sizes, the bits included in the package are 3/16-Inch and 9/32-Inch slotted, along with No. 1 and No. 2 Phillips. The size and weight of the ​Klein Tools 4-Piece Magnetic Screwdriver Set​ are pretty much perfect, while the grip provided by the high-quality handles is equally impressive. Admitted the hard plastic could get uncomfortable or difficult to use when wet, but this really is a very slight issue only with the set. In terms of balance, feel and performance in general, the Klein Tools 4-Piece Magnetic Screwdriver Set comes highly recommended. If you’ve only ever encountered the more substandard interchangeable tip-kits on the market, the Klein Tools 4-Piece Magnetic Screwdriver Set could be the total package you’ve been waiting for. Certainly a superb buy at this kind of price with nothing but positive reviews from current users. As you can see from the image, the Klein Tools 5-Piece Magnetic Screwdriver Set comes complete with one primary magnetic screwdriver and four interchangeable bits. While these kinds of kits and designs may be quite common, the quality of the Klein Tools 5-Piece Magnetic Screwdriver Set takes it to a much higher level. The size and weight of the Klein Tools 5-Piece Magnetic Screwdriver Set are pretty much perfect, while the grip provided by the high-quality handles is equally impressive. In terms of balance, feel and performance in general, the Klein Tools 5-Piece Magnetic Screwdriver Set comes highly recommended. If you’ve only ever encountered the more substandard interchangeable tip-kits on the market, the Klein Tools 5-Piece Magnetic Screwdriver Set could be the total package you’ve been waiting for. ​Last up, if you’re looking to take your mobile device to bits for any reason, you need the perfect tools for the job. This outstanding ​OEM tool repair kit​ has been designed to provide you with every single major tool you’ll need to carry out most repairs and upgrades. Compatible with most major brands and devices, it could turn out to be the only Smartphone repair kit you’ll ever need! ​The precise nature of the work involved when upgrading or repairing mobile devices calls for equally precise tools. 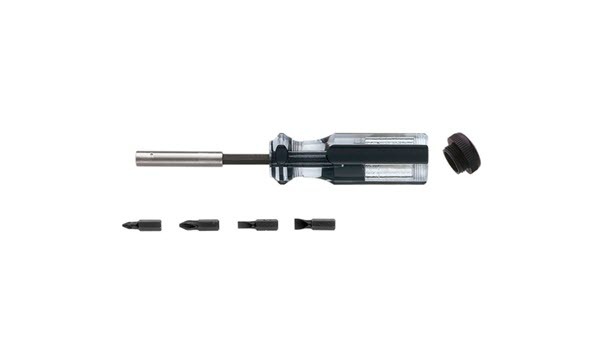 In the case of this outstanding kit, precision Torx screwdrivers are included in sizes T3, T4, T5, T6, T7, T8, T10. In addition, the kit also features a precision cross-head screwdriver, an additional flathead screwdriver and a pair of high-quality tweezers. Across the board, everything features the high-quality magnetic tips you need to make things easier when dealing with the tiniest components. Durability has also been taken into account by the manufacturer, as these kinds of precision tools are often far too fragile to work with. In addition, the grips on the primary drivers are far more comfortable and secure than you’d usually expect with these kinds of tools. Ideally-suited to laptops, mobile phones, tablets, eyeglasses and so on, it’s the ideal kit for anyone looking to go about their own repairs and upgrades. As for device compatibility, the kit is perfect for use with most Motorola phones, LG phones, Samsung phones, Treo Palm, Blackberry, HTC, Audiovox Pda and more. If you’re planning to go poking about in any precision devices, we’d highly recommend arming yourself with the very best precision toolkit before getting started! The precise nature of the work involved when upgrading or repairing mobile devices calls for equally precise tools. ​The humble screwdriver has a practically endless range of applications and is just about the most versatile tool in the box. Unfortunately, quality standards differ enormously from one screwdriver and collection thereof to the next. It’s one thing to know the size and type of screwdriver you need, but it’s just as important to factor quality into the equation. Otherwise, you may find yourself with something of a disposable product that really wasn’t worth picking up in the first place. In fact, the wrong screwdriver for the job can potentially do irreparable harm and perhaps even prove hazardous to health and safety. Hence the importance of not taking things for granted when picking up a set of screwdrivers for any purpose. On the plus side, ensuring you take home only the very best screwdrivers doesn’t have to be particularly difficult. ​When it comes to screwdriver heads, it isn’t all about shape and size. You, of course, need to ensure that the screwdrivers you buy are appropriate in terms of size and shape, but you also need to consider the quality of the heads. The reason is that depending on the material the head is both made from and finished with a final coating of, you could be looking at ultra-durable tools for the long-term or a screwdriver that’s liable to break in no time at all. As such, it’s worth doing yourself a favor and ensuring that only premium materials have been used. ​A flathead screwdriver refers to the type of screwdriver with unsurprisingly, a flat/straight edge. Typically available in a vast array of shapes and sizes. ​Designed for taking care of slightly more niche applications, hex screwdrivers feature a head with six sides in the shape of a hexagon. Though likewise featuring six ‘sides’ as with a hex screwdriver, Torx screwdrivers have a head designed in something of a star shape, rather than a hexagon. ​The Philips head screwdriver comes in a wide range of shapes, sizes, and specifications and is also commonly referred to as a cross-head screwdriver. ​The shaft of a screwdriver is the metal bar that connects the head to the handle. Despite often going entirely overlooked, the quality of the screwdriver shaft can and often does make all the difference. 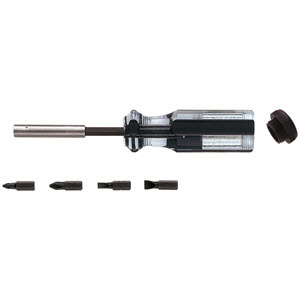 Along with providing sufficient strength so as to enable the screwdriver to be used appropriately, the material used to manufacture the shaft will also affect the weight and balance of the screwdriver as a whole. What’s more, some screwdrivers feature a shaft the continues all the way through the handle, enabling the screwdriver to be used in conjunction with a hammer or mallet. 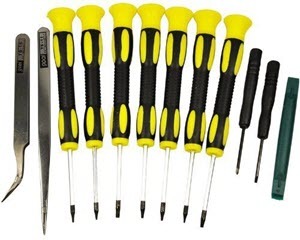 ​The alternative option to buying a complete set of screwdrivers is to buy a kit that features one or more handles and a selection of interchangeable bits, which can be a great option for those who may need to prioritize compactness and portability, not to mention value for money. ​It’s also important to take into account both the quality of and the materials used in the manufacture of the grip. Some screwdriver grips are designed to be comfortable to hold during prolonged use and non-slip-even when things get dirty, greasy or wet. By contrast, others are downright uncomfortable and difficult to hold and the best of times. So before making your final decision, be sure to look into how safe and comfortable (or otherwise) the grip happens to be.